Draft: 2014, Miami Marlins, 3rd rd. Brian Wade Anderson...married fiancée, Alex Smith, this past offseason...played three seasons for University of Arkansas, batting .318 over 171 career games for the Razorbacks...was second-team All-SEC as a sophomore in 2013...garnered AllTournament honors at 2014 NCAA Charlottesville Regional after batting .615 in four games, with eight hits and a .688 on-base percentage...hit .328 in junior season, with seven homers and 51 RBI; was first Razorback to reach 50 RBI since 2011...in college, homered off teammates Drew Steckenrider (Tennessee) and Brett Graves (Missouri)...avid video gamer. 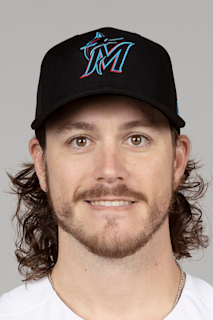 Finished first full Major League campaign batting .273 with 34 doubles, four triples, 11 home runs, and 65 RBI in 156 games played...Among Marlins' single-season rookie leaders, ranked second in walks (62), third in runs and OBP, fourth in doubles, tied for fifth in hits, and ninth in average...Opened season with a seven-game hitting streak, which was snapped on April 7 at Philadelphia. Marked third-longest streak by a rookie to start a season in Club history; Hanley Ramirez and Alejandro De Aza both recorded eight-game streaks to begin the 2006 and '07 seasons, respectively..Hit first career home run on April 2 vs. Boston, a second-inning, solo shot off Brian Johnson...Tied Club record for walks by a rookie in March/April (Derrek Lee, 1998); tied Mark Kotsay (1998) for second-most hits, one shy of record held by Hanley Ramirez (2006); third in RBI, behind Lee (21) and Josh Willingham (20 in 2006); and tied Lee for third in runs, behind Ramirez (20) and Kotsay (16)... Became ninth rookie (12th time) in Club history with three-ormore extra-base hits in a game on June 11 vs. San Francisco (two doubles, home run)...Had two game-tying hits on June 11 vs. San Francisco; first Marlin to do so since Cole Gillespie (two on 8/8/15) and first rookie since Chris Valaika (two on 4/21/13). - Elias...Had a career-long and team season-high 24-game on-base streak snapped on June 28 vs. Arizona; longest streak by an MLB rookie last season, tied for fifth longest by a rookie in Club history, and tied for 19th-longest streak by any Major Leaguer last season...Finished June with Club rookie record for that month in walks (13); had second-most hits (34); tied for second-most RBI (16) and doubles (8); and third-most runs scored (17)...Set Club rookie record for hits in first half (109); was second in doubles (23) and RBI (49); tied for second in walks (37), extrabase hits (34); third in runs scored (55); and was fourth in average (.288) and on-base percentage (.363)...Had first career hit, home run, and RBI as a pinch hitter on August 25 vs. Atlanta. Established professional highs in nearly every offensive category between Double-A Jacksonville, Triple-A New Orleans and Miami... Combined to hit .273 (140x513) with 28 doubles, four triples, 22 home runs and 89 RBI over 145 games...Led all Marlins' minor leaguers in home runs (22) and RBI (81), while ranking eighth in batting average (.275)... Began year with Double-A Jacksonville, appearing in 87 games, posting a .251 average (78x311) with 14 doubles, three triples, 14 home runs and 55 RBI...Went 3x5 with a season-high four RBI on June 2 vs. Pensacola...Added six three-RBI and seven two-RBI games while with Jumbo Shrimp...Had season-long nine-game hitting streak with Jacksonville, batting .344 (11x32) from June 18-30...Named Marlins Minor League Player of the Month for June after hitting .333 (28x84) with a double, two triples, five home runs, 12 RBI and 1.006 on-base plus slugging percentage in 26 games... Garnered Southern League Midseason All-Star honors and was selected to participate for Team USA in 2017 Futures Game held at Marlins Park. Went 2x4 with a run scored in USA's 7-6 win over the World Team, starting as DH before moving to third base...Promoted to New Orleans on July 15, where he hit .339 (40x118) with seven doubles, eight home runs and 26 RBI in 33 games...Appeared in 25 games at third base with Miami after having contract selected from New Orleans on September 1...Made MLB debut and recorded first career hit on September 1 vs. Philadelphia, an infield single off Nick Pivetta...Began career with four-game hitting streak (.286/4x14), and had a hit in six of first seven games...Overall, had a hit in 15 of 21 starts (.269; 21x78), with four multihit games. September 1, 2017 Miami Marlins selected the contract of 3B Brian Anderson from New Orleans Baby Cakes. July 15, 2017 3B Brian Anderson assigned to New Orleans Baby Cakes from Jacksonville Jumbo Shrimp. July 11, 2017 Jacksonville Jumbo Shrimp activated 3B Brian Anderson from the temporarily inactive list. July 8, 2017 Jacksonville Jumbo Shrimp placed 3B Brian Anderson on the temporarily inactive list. March 23, 2017 Miami Marlins optioned 3B Brian Anderson to Jacksonville Jumbo Shrimp. January 12, 2017 Miami Marlins invited non-roster 3B Brian Anderson to spring training. May 31, 2016 3B Brian Anderson assigned to Jacksonville Suns from Jupiter Hammerheads. March 21, 2016 2B Brian Anderson assigned to Miami Marlins. November 2, 2015 2B Brian Anderson assigned to Mesa Solar Sox. July 18, 2015 Jupiter Hammerheads activated 2B Brian Anderson from the 7-day disabled list. April 6, 2015 2B Brian Anderson assigned to Jupiter Hammerheads from Greensboro Grasshoppers. March 21, 2015 2B Brian Anderson assigned to Miami Marlins. July 15, 2014 2B Brian Anderson assigned to Greensboro Grasshoppers from Batavia Muckdogs. June 13, 2014 Miami Marlins signed SS Brian Anderson. June 13, 2014 SS Brian Anderson assigned to Batavia Muckdogs.